I've used bubble wrap on windows for two three+ years now, and I'm amazed how quick and easy it is. This year, we are even covering the windows in the guest room -- we just take the bubble wrap down when guests come, and put it back up when they leave -- 15 seconds a window. 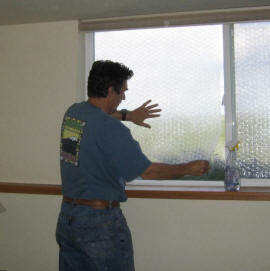 This is a simple technique for insulating windows with bubble wrap packing material. Bubble wrap is often used to insulate greenhouse windows in the winter, but it also seems to work fine for windows in the house. 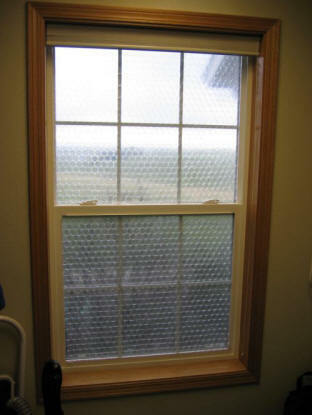 You can use it with or without regular or insulating window shades. It also works for windows of irregular shape, which can be difficult to find insulating shades for. 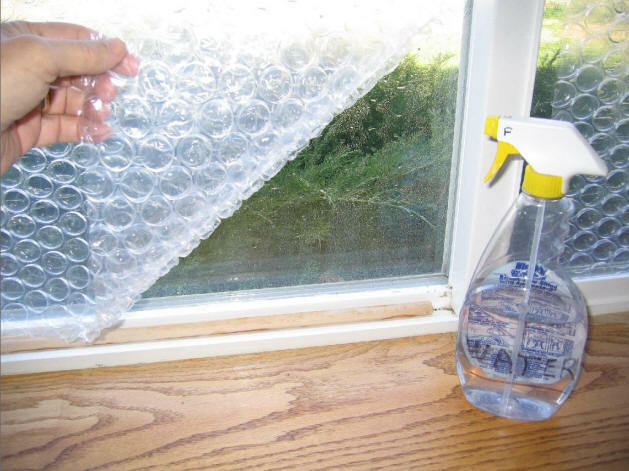 Its been five years since I put this page up, and I've heard from MANY people who are quite happy with using bubble wrap for window insulation. The view through the bubble wrapped window is fuzzy, so don't use it on windows where you need a clear view. But, it does let plenty of light through. I know you came here to look at bubble wrap for your windows, but our site also has literally hundreds of good practical projects and ideas on energy efficiency, solar heating and electricity, and the Half Plan to help you cut your total energy use in half. measurements) to insulate a little better, and you still get a nice artistic effect looking out of them. The small bubble warp totally obscures the view, but you still get light. Most people seem to prefer the large bubble version. Cut the bubble wrap to the size of the window pane with scissors. Spray a film of water on the window using a spray bottle. Apply the bubble wrap while the window is still wet and press it into place. The bubble side goes toward the glass. To remove the bubble wrap, just pull it off starting from a corner. You can save it and use it for several years. It does not leave a mess or stains on the window glass. 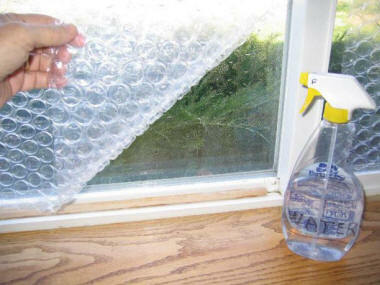 If you have trouble with the bubble wrap separating from the window when the film dries, you can try adding a little Glycerin to the water, but this probably won't be necessary. A few small pieces of double back tape can be helpful on really stubborn windows. The bubblewrap can be installed in the fall, and removed in the spring. Judging by how mine looks after a year, it may last quite a while. When you take the bubble wrap down, put a small number in on the upper right corner of each piece of bubble wrap, and write down which window that number goes with on a piece of paper. Save the paper for the installation next fall. This tells you instantly where each sheet goes, and which way its oriented. - Check places that sell larger items like canoes or furniture -- bubble wrap is often used for packing these. - Check for wholesale suppliers of packing material in your area -- these places will often sell a roll to the public. - As a last resort, places like the UPS store have it, but the prices are usually high. "Bubble wrap small bubble and large can be had for free by contacting furniture retailers or rental shops. They throw it away by the tons!" I've heard the same thing for places that sell canoes. contact holds it in place. I thought it might be worth a try to see if two layers of bubble wrap might be used. This may be going a bit far, but it does seem to work. I applied a 2nd layer of bubble wrap over the first layer in exactly the same way as the first layer was applied to the window glass. That is, spray the first layer of bubble wrap with water mist, and while its still wet apply the 2nd layer of bubble wrap to it and smooth it out. For both layers, the bubble side face the glass. It has been a couple days since I did this, and it is staying in place OK -- not sure if it will stay up with the added weight in the long term or not. The two layers of bubble wrap fuzzy the view a bit more than one layer, but it still seems to transmit quite a bit of light. The surface temperature on the 2nd layer is higher than the surface temperature on the first layer, so it is adding some insulation value. View through single and doubled bubble wrap. Blue tape is to take temperature readings on with the IR thermometer. For an 7000 deg-day climate (northern US), and single glazed windows, the bubble wrap increases the R value from about R1 to about R2. This cuts the heat loss from the window in half. The bubble wrap cost about $0.30 per sqft, so the payback period is about 2 months -- not too bad! If you repeat the numbers above for double glazed windows, the saving is $0.60 per sqft per season, and the payback period is a about one half heating season. If you use a more expensive fuel like propane, fuel oil, or electricity, the savings will be correspondingly more. Some interesting work done by students at LIU on insulation value of packing materials. Probably not exactly applicable to windows, but interesting. There have been a few questions on whether bubble wrap is effective in reducing unwanted heat gain in the summer. The answer is that it does help some, but there are probably better approaches. The bubble wrap adds insulation, so just as this added insulation helps to reduce heat loss from the warm room to the cold outside in the winter, it also helps to reduce heat gain from the hot outside to the cool room in the summer, and that is good and helps the room run cooler. But, heat gain also comes from the sun shining right through the window and the bubble wrap and then being absorbed when it hits a surface in the room. In the winter, this direct absorption of solar radiation is a good thing in that its free heat gain -- its one of the nice features of bubble wrap that it allows the sun to shine right through it and get beneficially absorbed in the room. But, in the summer this direct absorbtion of solar radiation in the room is a negative and its a big part of summer heat gain for windows that get a lot of direct sun. For summer heat gain with windows that get direct sunlight its really important to prevent the sunlight from shinning through the window and into the room. The best way to do this is to stop the sunlight outside the window by shading the window on the outside in some way. The shading can be things like shade trees or bushes, shade screen (which still allows some light into the room, but blocks most of the heat gain), or completely opaque shades on the outside of the window that block all of the sun. If its not possible to shade the window on the outside, than another approach is to place a reflective surface (like a shade) just inside of the window with the reflective side facing the window. This reflects much of the sun right back out the window so it is not absorbed and converted to heat inside the room. Surfaces like aluminum foil or a reflective white paint are good at reflecting sunlight back out the window. The section on passive cooling has a lot of ideas and schemes for reducing summer heat gain. The window shading page in particular has ways to reduce heat gain through windows. Doug reports that bubble wrap that he installed 6 years ago has about had it. He thinks the life is around 5 to 7 years. In his application, the bubble wrap stays up year round. He reports that at the end of its life, it tends to stick to the glass, so replacing it before this happens might save some cleanup work. The bubble wrap he is using was intended for packaging, so this still leaves open the question of whether the bubble wrap intended for greenhouses will last longer. The greenhouse bubble wrap we installed is on its third winter, and is still doing fine.